Folktales from many regions of the Indonesian archipelago. 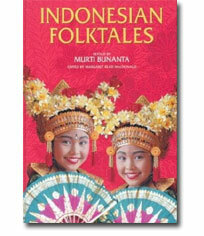 Researched and retold by Indonesian teller Murti Bunanta. With photographs. "The stories really come alive both through the retelling and through the extensive history that’s included…backgrounds that will make them more meaningful both in the retelling and in their study." ...Dan Keding, Sing Out! Murti Bunanta’s storytelling and children’s literature organization website.